A mass of charred seeds found while clearing a home construction site in Brantford, Ont. has been identified as ancient, domesticated goosefoot, a form of quinoa native to eastern North America. The seeds date back to 900 BC, and have never been found north of Kentucky this early in history, says Gary Crawford, a professor in the department of anthropology at the University of Toronto Mississauga, who was brought in by Archaeological Services Inc. (ASI), the archaeological consulting firm that excavated the site. Archaeological discoveries don’t normally shock Crawford, but this one comes close. 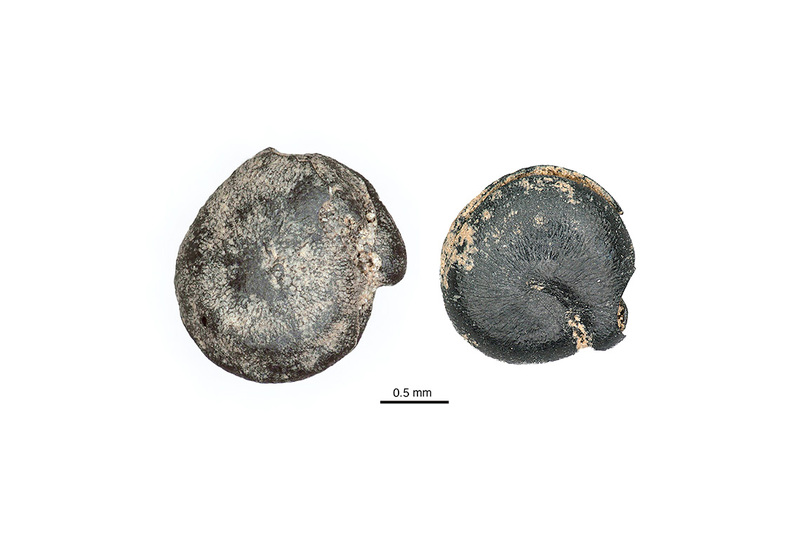 The charred seeds, about 140,000 in total, were discovered in Brantford in 2010 during a required archeological assessment conducted by ASI prior to site development. The Tutela Heights site, which has since become a housing development, yielded some stone tools, post holes, debris and the seeds. Jessica Lytle, a co-author of the resulting research paper, was one of the assessors who did the initial seed analysis and brought them to Crawford for further analysis, having studied with him at U of T Mississauga. The analysis took time, especially given the number of seeds and the need to document whether the whole collection was from the same crop. Their findings are published in the December 2018 issue of American Antiquity. “This discovery raises more questions than it answers,” says Ron Williamson of ASI, another co-author. “We had to consider whether the seeds were only traded here or grown locally. Indigenous peoples at the time exchanged certain kinds of minerals and finished stone objects over long distances, but this is the first evidence of a crop circulating in this exchange system. What meaning this plant had for local Indigenous people nearly 3,000 years ago still is not clear. The researchers also explored how and why the seeds were charred. They speculate that it may have happened accidentally when the local inhabitants were attempting to parch them. For Crawford, the next step in answering some of the questions will be to review seeds in his lab that were collected at other sites in Ontario to see if there are other charred seeds that may be variations of this subspecies and to examine other Ontario seed collections. Today, there is a weedy version that grows locally and he is curious whether this is a holdover from Indigenous agriculture. “All of these bits of data demonstrate that the Indigenous Canadians were knowledgeable, sophisticated and well-connected across Eastern North America,” Crawford says.